Did backup Mark Jackson actually attempt to turn the 2002-03 Utah Jazz locker room against Jazz starting point guard and future Hall-of-Famer John Stockton? During the 2002 NBA Draft, the Knicks traded Mark Jackson to the Denver Nuggets. The 37-year old quickly let it be known he had no interest in playing on a rebuilding Denver team that would eventually go 17-65, and negotiated a buyout before the start of training camp. Utah’s 2001-02 backup PG John Crotty had a surprisingly effective season for the Jazz but missed 41 games including the postseason due to knee issues. In the 2002 offseason the Jazz let Crotty walk while penciling in 2001 1st-round pick, talented Raul Lopez, in to assume the backup role behind the 40-year old Stockton. That plan fell apart when Lopez re-injured his ACL in August, sending the Jazz scrambling. They signed a relative unknown in Carlos Arroyo, and then appeared to catch a break when Jackson and the Nuggets agreed to part ways. The 2002-03 Jazz season was a roller-coaster. Utah started the season with DeShawn Stevenson and Andrei Kirilenko in the starting lineup, but the starting unit (including Stockton, Karl Malone and Greg Ostertag) could never seem to mesh. Amidst a 3-7 start, Jerry Sloan replaced Stevenson/Kirilenko with Calbert Cheaney and Matt Harpring in the starting lineup – and the Jazz suddenly vaulted themselves back into the playoff picture, ripping off streaks of 8-1 and 13-3 to find themselves sitting at 25-15 midway through January. Shortly after, Jerry Sloan would be assessed a 7-game league suspension for shoving referee Courtney Kirkland and the Jazz would go 21-17 the rest of the way. In 2003 the rumors of the “divide” were that Jackson politicked with several Jazz bench-warmers that they deserved more minutes and that the team needed to run more (with Jackson claiming to be better suited to play that style than Stockton) while Malone, Ostertag, and Harpring backed Sloan (and Stock). There can be no better source than someone who was actually inside the 2003 Jazz lockerroom, and that’s exactly where former Jazz center Greg Ostertag was. No player has had more “run-ins” with Jerry Sloan, although eventually they both grew to respect and care for the other. In 2008, Greg Ostertag called into a radio show and spoke with Jazz host David Locke, in which Ostertag said Mark Jackson would “stir the pot” and the ever-classy Locke referenced Jackson as a 4-letter unprintable word. During Mark Jackson’s tenure as an ABC/ESPN analyst, he became the initial voice to champion the notion that Tim Duncan was the best power forward to ever play (misguided by the fact that Duncan is a center, Malone statistically was a better player, and that even today an overwhelming majority still hold Malone in higher regard). Additionally in a 2010 B.S. Report with Bill Simmons, while briefly analyzing the Utah Jazz Mark Jackson noted that Jerry Sloan’s distinguished record spoke for itself while slipping in a caveat that “I don’t agree” with Sloan’s coaching methods, before continuing on with his discussion. Mark Jackson is a licensed minister who has been married to a gospel singer who is now his fellow pastor since 1990. In June of 2012, the then 47-year old Mark Jackson made headlines as victim of an extortion plot that revealed he had an extramarital affair with a 28-year old stripper in 2006. Jackson initially paid off the victim and her co-conpsiritor with $5,000 and Warriors tickets before eventually going to the FBI as the monetary demands continued. I’m not trying to judge another man’s faith, and for the sake of both Mark Jackson and his family I hope he has sincerely and truly turned the corner and put this mistake behind him. However, this incident’s lapse in judgment further exhibits a pattern of hypocrisy where Mark Jackson’s discreet actions belie his reverent words. John Stockton was a career 52% shooter and shot 50% or better in 12 of his 19 seasons. Due to his role and unselfish nature, he may not have been the “prolific shooter” Jeff Hornacek was, but it is absurd for anyone to go out of their way to say Stock wasn’t a “great shooter” when virtually every statistic says otherwise. I think it’s evident from all the smoking guns that Mark Jackson clearly played antagonistic role in Stockton’s final season, resented Jerry Sloan and his coaching decisions – and judging by his recent comments still holds some sort of grudge against Stockton. As someone infamously likes to say, “hand down, man down” – and Mark Jackson continues to sink lower with his clear bias against John Stockton. 2014 is upon us but let’s take one last look back at 2013 – and the 5 biggest storylines for the Utah Jazz. The Utah Jazz packaged their 14th and 21st picks in a draft night trade with the Minnesota Timberwolves netting them the draft rights to Trey Burke – the 9th-overall pick and collegiate player of the year who was widely considered the top point guard available. After missing the first 12 games with a broken finger, the early reviews have been terrific. Despite lingering questions after a rough summer league performance, Burke has made a seamless transition adjusting to the NBA 3pt-line where he’s shooting 38% from and playing against NBA length – where just 11 of his 284 shot attempts have been blocked. Burke has posted averages of 14.4 points, 5.5 assists and just 1.9 turnovers since taking over the starting position. His current season average of just 1.8 turnovers per game are the lowest by a fulltime Jazz starting point guard since Ricky Green in 1986-87. That average may not continue but it emphasizes (even with a recent rash of TO’s last week) how remarkably well Burke has been handling the basketball. Burke’s biggest performance so far was a 3o point, 8 assist, 7 rebound night in Orlando), and has hit numerous clutch shots late in games (against Chicago, Phoenix, Houston, and Charlotte), and is now one of the favorites for NBA Rookie of the Year. The questions about Burke now have become how high is ceiling ultimately is, and that’s a great sign when you’re still talking about a 21-year old rookie. After failing to qualify for the 2013 postseason during a season in which the playoffs were identified as the ultimate goal – the Jazz opted to retain Ty Corbin after two-and-a-half seasons on the job. As an indirect result, bright and widely respected assistant Jeff Hornacek interviewed for both the Philadelphia and Phoenix openings before taking over as Suns head coach late in May. Despite a roster possessing comparable talent and experience to Utah’s, Hornacek’s Suns have shocked the NBA by racing out to a 19-11 record playing a highly-entertaining style focusing on tempo, floor-spacing and shot-selection. Of all the attributes used in the glowing reports on Hornacek, the most common one is how he builds confidence in his players. In a season in which the Jazz have seen noticeable struggles from Kanter, Burks and perhaps most disconcerting Hayward – confidence-building appears to be a quality sorely lacking from the Jazz coaching staff. Hornacek also heeded his general manager’s advice, bringing in former Boston defensive assistant Mike Longabardi who has improved the Suns’ 2012-13 23rd ranked defense to 13th as of January 1st. This blatant oversight can be smoothed over nicely if the Jazz land a potential franchise player in the heralded 2014 Draft while using the offseason to secure a quality long-term coach for the future. In the present, it continues to sting. As Hornacek has allowed young players such as Miles Plumlee, Markieff Morris, Marcus Morris, Eric Bledsoe among others to flourish, the Jazz continue to marginalize the development and experience of 3rd-year lottery picks Enes Kanter and Alec Burks while relying heavily on veteran pending free agents Richard Jefferson and Marvin Williams. Despite emphasizing improvement on team-defense entering the season, the Jazz’s defense has actually grown substantially worse – dropping from 21st in 2012-13 to 29th in 2013-14. 210 games into his head coaching career, it appears Ty Corbin will coach the final 48 games of the season as a “lame duck” coach in the final season of his contract. On October 19, less than two weeks before the window ended, the Jazz and Derrick Favors formally agreed to a 4-year/$47 million extension (plus incentives) to keep Favors in a Jazz uniform through the 2016-17 season. Not only is the longterm stability welcomed, the Jazz did it at a relatively low-risk cost that won’t hamstring their future flexibility (considering DeMarcus Cousins re-signed for $62 million) while allowing Favors to establish himself as a fixture on their frontline. While Favors may have disappointed Jazz analyst Matt Harpring during the preseason, he has quietly pleased the majority of Jazz fans during much of the regular season. He’s averaging 13.4 points and 9.0 rebounds while shooting 52% from the field and playing less than 32 minutes per game. In his last 25 games he’s shooting 55% from the floor and since the Jazz have mercifully altered his pick&roll defensive responsibilities, is averaging nearly 2 blocks per game. Always a presence going hard to the rim via the pick&roll, Burke’s playmaking ability has showcase more of Favors’ developing catch&shoot mid-range game on high screen-roll to the point he’s now shooting 46.2% on mid-range shots down the lane (8-16-feet), up from 37.8% (on middle-of-the-floor 8-16 footers) in 2012-13. In terms of shooting percentage – Favors has increased his accuracy from virtually every floor level this season, up to 58.8% from 0-8FT (from 55.9% in 2012-13), up to 42.5% from 8-16FT (from 31.5%) and 28.1% from 16-24FT (up marginally from 26.2%). While Utah may still have longterm questions at other positions, it’s clear Trey Burke and Derrick Favors solidify 2/5’s of their starting lineup for the next 4 seasons. In July Utah allowed 7-year Jazzman Paul Millsap to walk in free agency, where he signed a bargain-basement 2-year/$19 million contract with the Atlanta Hawks. This was done primarily under the pretense that the Jazz were serious about allowing both Derrick Favors and Enes Kanter to develop and grow on the court together. Instead the Jazz coaching staff concluded that their nightmare start (that was heavily affected by the absence of Trey Burke as well as the lack of an effective offensive system and bizarre defensive strategies) verified that Favors and Kanter simply could not play together. As a result, the Jazz are now starting 8-year veteran Marvin Williams at power forward. As a starter in the final year of his contract, Marvin is having a career year from behind the arc shooting 41% while averaging nearly 30-minutes per game. Conversely, Enes Kanter’s playing time has declined to 22.6 mpg when coming off the bench. In Atlanta, Paul Millsap is playing at a near All-Star level averaging 17.8 points and 8.6 rebounds while averaging 2.6 three-point attempts per game on 43% 3pt-shooting despite attempting just 39 threes all of last season in Utah. In his last 5 games, Sap has been spectacular posting averages of 25.8 points per game to go along with 11.2 rebounds on 50% shooting. There are valid reasons for starting Marvin at PF, but if any of those reasons meshed with Utah’s offseason goals just 6 months ago, then the Jazz made a clear mistake not re-signing Millsap – who would fit their “stretch-4” role better than Marvin in virtually every facet. Not only are they currently starting the lesser option of the two, it comes at the price of marginalizing both the development and trade-value of the #3-overall pick in the 2011 draft while not providing any tangible short-term benefits such as a surprise playoff berth. A 3-12 stretch last March sabotaged the Jazz’s playoff hopes, as the Lakers narrowly limped by them for the 8th-seed on Kobe Bryant’s tired and eventually wornout legs. Following the 2011-12 season in which the Jazz secured the #8-seed before being swept by the Spurs, that step back along with the gradual assimilation of Dennis Lindsey into his general manager role sparked an apparent shift in Utah’s philosophy. Lindsey’s preseason comments echoed the team’s approach the following summer, where he identified “3 D’s” as his goals for the Jazz – being establishing a defensive culture, development of young players and a disciplined level of play. The Jazz currently have the 2nd-worst record in the league and appeared poised for a high draft choice. Had the Jazz secured the 8-seed and won a game or two, perhaps the franchise would have been more inclined to bring back Al Jefferson, Millsap, and Mo Williams which would have relegated them to middle-of-the-pack status and further stifled the development of their young core. Their current blueprint hasn’t been perfect, and obviously retaining Corbin (which elimintated the possibility of considering Hornacek) appears to be a huge mistake, but this path still allows Utah to right that wrong in the 2014 offseason while perhaps also making a franchise-altering draft pick. A new coach and the addition of a potential all-star (whether it be Jabari, Wiggins, Randle or Embid or a late-riser), would put some serious shine on the bright Jazz future that may have dimmed over the past couple seasons as internal growth was impeded. Nevertheless, I’m convinced this youth movement remains the best path for the franchise as long as all parties (ownership, management, and coaches ) are fully committed to it. Five years from now, I hope we look back at the conclusion of the 2012-13 season as impetus for a franchise course-correction, under Dennis Lindsey’s guidance. 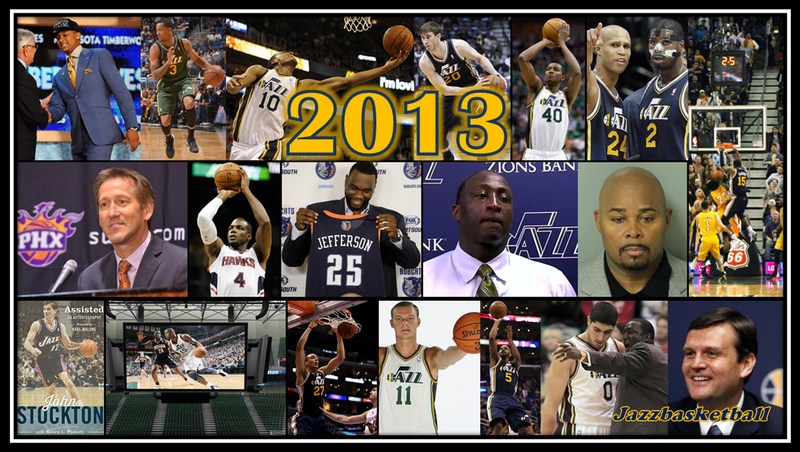 For the Jazz, 2013 was a year of change, a year of frustration and a year of promise. Let’s hope it will ultimately be remembered as the first of several baby-steps in the right direction for the Jazz, as they look to once again build a potential title-contender.